The Bituminous Materials Safety Guide describes safe working practices and disposal of waste materials to be used when handling hot bituminous products in sprayed sealing, asphalt and bituminous stabilisation operations. This Guide is intended to provide basic material to assist with the training of inexperienced users and a refresher for experienced personnel. It is designed to be used as a ready reference. References to codes and regulations have been based on the best available information at the time of compilation, and may change or differ from place to place. Practitioners should check their local status and regulations to ensure compliance. The Guide is intended to complement each company’s own work and health safety management system and as such should be used in conjunction with company Standard Operating Procedures and Safe Work Method Statements. It should also be read in conjunction with equipment and supplier recommendations for the supply and application of bitumen products. The Bituminous Materials Safety Guide is published is a handy glovebox A5 size. 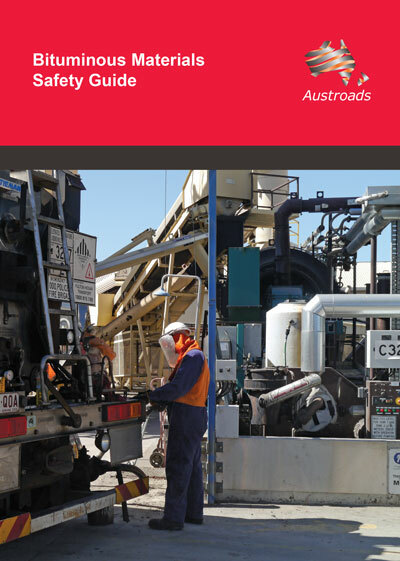 This Guide is the fourth edition and includes revisions related to updates to the Australian Code for the Transport of Dangerous Goods by Road and Rail (ADG Code) and Australian Standards. The Guide has also been modified so that it predominantly contains only safety related information.